That's what the doctor said to me today. Tore the ACL. Damaged (not clear the exact nature of this) the meniscus. He said some people treat this very conservatively (I thought: my mother! ), but that he recommended surgery. He would do a graft with tissue from a corpse. He started explaining how this was safe, etc., and I said, "Oh, I'm not squeamish--I think it's fascinating." He said, "It really is." Did you know that I once aspired to be "that kind" of doctor? Well, not an orthopedist, but something where I could directly help people. I was mostly put off by the massive amount of science and mathematics courses I'd have to take, given that I was sure to do poorly in them. I came to college with basically no science--no bio, chem, nada--and very little math. I barely passed pre-calculus and that was the end of my math career. Anyway, I don't really regret it--I have enough problems getting along with people that having a profession where I was always working directly with sick people probably wouldn't have been the best for me. Then again, my chosen profession isn't the best for me either. What can you do? 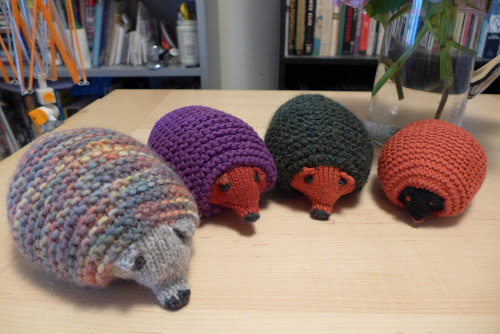 I know what you can do...knit hedgehogs! Back when I was on the "knit hedgehogs for Israel" tear, I was posting pictures on Facebook. And a bunch of people--distant friends, family, etc.--wanted hedgehogs. Now, some of these are people I knit for anyway. Some of them have to gently encourage to accept gifts. For people like that, of course they get a hedgie. But some of these people, I barely know them! One is a woman I went to grad school with, but I can't remember really ever talking to her, though I'm sure we had a couple of conversations. We were TAs for the same massive lecture class but she had to quit halfway through due to an unknown (to me) medical issue. That's basically all I remember about her--and that she was quiet and seemed pleasant. Some time ago, as people do, she friended me on FB. Fine, she was nice enough, so I accepted the friend request. Since she started after me, she probably had a clearer recollection of me than I did of her (you know--one of those senior/freshman deals)--and if she wanted to be "friends" then maybe it was a positive recollection. I'm sure I was slightly flattered. Anyway, she's married and has adorable twin daughters. I enjoy seeing pics of them from time to time on FB, though I don't know much else about her life (did she move recently? yes. where does she live now? Not exactly sure. Is she teaching? Um, not sure of that either). Regardless, her daughters are getting hedgehogs--the two in the middle--as soon as I can make my way to the post office. The other two are for my mother and my cousin's son, from left to right. Now to a "real time" update. I have knee surgery scheduled for the end of July. I have a small support group of about 5 or 6 friends lined up to come and visit me and help out with the household chores and such. I can't pretend that this isn't harder with no permanent roommate/partner/spouse--but it's really heartening to see how my friends have come through in a pinch. I saw it with the 4th of July party, when I barely had to lift a finger, and I'm seeing it again in a true time of need. So...I must be doing something right. I know I'd do the same for my friends if they needed me, but it's good to know they are willing to help me out. I'm trying to spread things out so no single friend feels over burdened, but I know the ones who live nearby will probably end up doing more...still...it will be nice to see people and get care from a few different hands. I think I'll learn something too. Being at the grand jury has been good. I kind of love it. I watch the attorneys doing their thing and I think, "I would be really good at that." So...should I go to law school? Ha ha! Beyond that, what else can I say? Things are no better at the office. Certain people are still crazy, controlling, and, in a somewhat recent development, in compete denial of factual information. I am still planning to leave and yet the decision hasn't gotten any easier. I do hope your summer has been slightly less eventful than mine--or the events are of the more cheerful, uplifting variety. Grateful for: my friends--more than ever. "should I go to law school?" Oh my God, no. I realize you were joking, but...no. Please elaborate! I was mostly joking, but I'm mulling the idea. That's how bad things are where I work! Lol, I'll echo Meg. Sorry about your ACL. The repair is a very common procedure and most people have a pretty smooth recovery, so sending best wishes your way and hoping selfishly for a flurry of blog posts in late July! Thanks--you lawyers are so crazy. Don't do it! Wait a few months and see how your knee feels. It's common for people to function normally without an ACL. The long-term negative repercussions, ie. conic pain, scarring, and atrophy, far outweigh any short term benefits. But if you play in the NFL, NHL, NBA, MLB, NLL, or Premier, then go ahead and do it. Take it from me, I'm a former professional athlete, a juris doctor (so you can trust me), and a recovering two time ACL reconstruction victim. First--I'm not sure "blogger" counts as a name so if you comment again, please pick something more descriptive. I have a "no anonymous comments" policy. Second--I know I could live without an ACL, but why should I? A lot of things you cite could happen either way and future injuries may be forestalled with the surgery. Not to mention that I still can't straighten my leg after almost four weeks so they have to get in there and clean up the meniscus at the least. I was a collegiate athlete and like to be pretty active, have no risk factors, and I'm still in pain so I think it makes sense for me to go ahead. Third--you're not that kind of doctor. ;) Neither am I.
Ugh. So sorry to hear about this. When I had foot surgery (way longer recovery time), it really sucked not to have a live-in adult, though my then-eight-year-old (!) did learn to make me oatmeal. I'm glad you have a good pit crew and wish I was close enough to help. I wish you a swift recovery and new perspectives (which I certainly got from temporary disability). While I would never claim that having a bum knee is enjoyable, I do like having that new perspective. I sometimes forget how much I like having new experiences--and hobbling around on crutches definitely counts! It's not fun, it's hard, but it's also interesting. So, I'm hoping for an easy procedure and speedy recovery. I'm going to work hard at the PT and enjoy the downtime as much as possible. I'm going to unplug from work for at least a week and watch a lot of movies. I'm going to enjoy the friendly visits and all will be well.